Proper care and cleaning can keep your patio furniture looking new for many years. Summertime’s in full swing. You’ve put the finishing touches on your outdoor living area and you’re enjoying Sunday barbecues and evenings relaxing by the fire pit. But are you thinking about the maintenance of your outdoor furniture? Regularly cleaning your outdoor furniture will ensure that it lasts throughout the seasons. And cleaning it right will ensure that you’ll get to enjoy it for many years to come. Here’s what you need to know to properly clean the most popular outdoor furnishing materials. 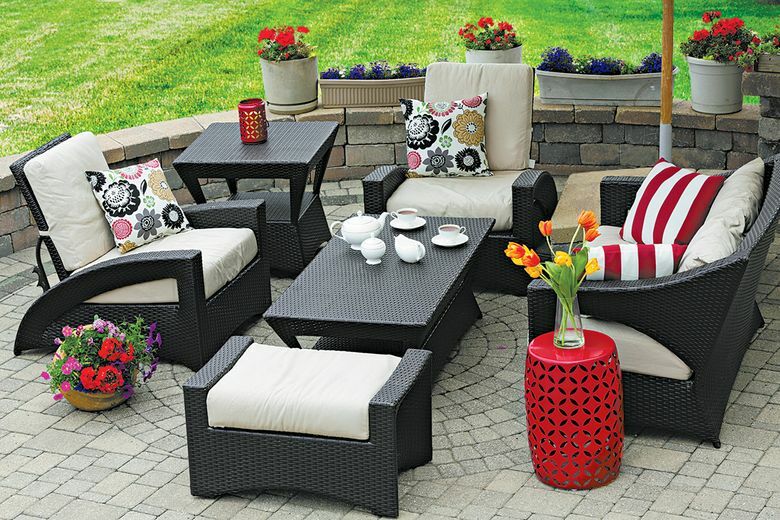 Outdoor wicker furniture must be maintained every season. Too much heat can make the weave brittle, while too much moisture can cause mold growth. During winter, store the items indoors or use patio covers to protect them from snow or rain. Some furniture is water-resistant. If yours is not, coat the pieces with a sealant if you plan to leave them outdoors for a prolonged period of time. Outdoor wooden furniture such as teak is relatively expensive and needs extra care to keep it in good condition. Spray with a wood cleaner and scrub the surface with a soft brush once every two weeks. Moisture is to wood what rust is to iron, so make sure you always keep your wooden furniture dry. Dampness will cause the wood to develop mildew. Weathering is common in wooden furniture, and it happens when the furniture is exposed to sunlight and rain. Apply wood oil and let it sit for several hours before you gently wipe the surface with a clean rag. Oil conditions the wood, restores the original color and provides added protection. During winter, deep clean the furniture before storing indoors, or invest in quality outdoor furniture covers. Aluminum furniture is durable and versatile — and it doesn’t need much care because it doesn’t rust like iron. However, it is necessary to maintain aluminum to extend its life. Wash with a low-pressure hose to remove any accumulated dirt or debris. And avoid high pressure as it could damage the finish. Spray a mixture of mild soap and lukewarm water onto the furniture and wipe it off with a clean cloth. Gentle and repeated wiping helps remove the scuffs caused by other metal objects. Avoid using abrasive cleaners or other chemicals. Clean wrought-iron furniture regularly using a rag dipped in a mixture of mild soap and water. Hose it off if there are intense stains — but be sure to dry it completely to avoid rusting. If the paint is wearing away, repaint it using a spray-on painter or a brush. Rusting can be a problem with wrought iron, so it’s necessary to take preventative measures after purchasing. Exposure to rain, acids in bird droppings and chipping paint can cause rust to develop. If the damage is mild, sand it off with the right type of sandpaper for your furniture. If the furniture is severely damaged, it’s probably best to replace it.